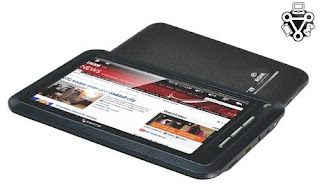 Home » news » BSNL launches cheapest Tablet : Penta TPAD IS701R in India. BSNL launches cheapest Tablet : Penta TPAD IS701R in India. so what's new in this tablet ? is it better than Aakash tablet ? what's inside in this tablet ? 1) You can browse the Internet, enjoy YouTube and other videos, check your emails and do a lot of other daily activities which you do in your Computer. 2)7” resistive touch screen (TFT Display) + The built in 2 GB memory can be expanded up to 32GB by using the on-board TF card slot. 3) The High Speed of 1 GHz processor & DDR2 256 MB RAM will make your experience with apps more faster. 4) You can find an Integrated HDMI port to connect your projector or LED/LCD TV. 5) It can play popular music,videos and all types of photo file formats. 6) You can download and install any Google android apps compatible with Android 2.3 Gingerbread. 7) You can access Internet wirelessly with High speed networking support (Wi-Fi 802.11 b/g) on TPAD IS701R. 8) Its very easy to access your emails, MS -Office and Games like Angry Birds in TPAD IS701R. 9) You can experience the power of social networking sites like Facebook,Google plus and Twitter at your finger tips. 10) Seamless Digital media experience in TPAD IS701R. 12) Rechargeable lithium polymer battery. so now you can say : "yes its better then Aakash tablet" ! The delivery of BSNL Penta T-Pad IS701R will start from 5/March/2012. you can pre-book it from here . hope they (pantel) will deliver faster.